The ST series from STAHL CraneSystems ranks among the most comprehensive chain hoist programmes on offer in world. In use in thousands of applications for many decades, modernised and optimised over and over again, the ST chain hoist is a true classic. Powerful, reliable and undemanding as far as maintenance and power consumption are concerned, the ST series comes in 13 S.W.L. ranges, from 125 kg to 6,300 kg. The chain hoists can be used as stationary hoists with suspension hook or eye, with rigid mounting, or with a push or electric trolley, and are especially suitable for rugged applications in industry. Thanks to the modular design of the ST series, we can develop a suitable off-standard hoist for every tricky problem. Not rarely do these developments later find their way into our standard hoist programme: e.g. the [extra] short headroom trolley with extremely short headroom. Or the STD dual chain hoist, which is now also available as STD Vario with adjustable spacing between the hooks. We also manufacture the complete ST chain hoist programme in explosion-proof design. STAHL CraneSystems was the first manufacturer to convert its entire chain hoist program to conform to ATEX. The SHK and SHK+ manual chain hoists and the SHKex explosion-protected manual chain hoists are a useful addition for manual workstations, flexible use and areas without a power supply. They cover a wide spectrum of applications with an S.W.L. range from 250 kg to 20,000 kg. Our training courses form an important part of the services we offer to our customers. You can only give your customers optimum advice if you always have comprehensive, up-to-date knowledge on our products. This applies to all of our Staff whom have attended the Stahl product training course for Chain Hoist and Explosion Proof hoists, where they learned everything required about erection and maintenance. People are a company’s most valuable capital. 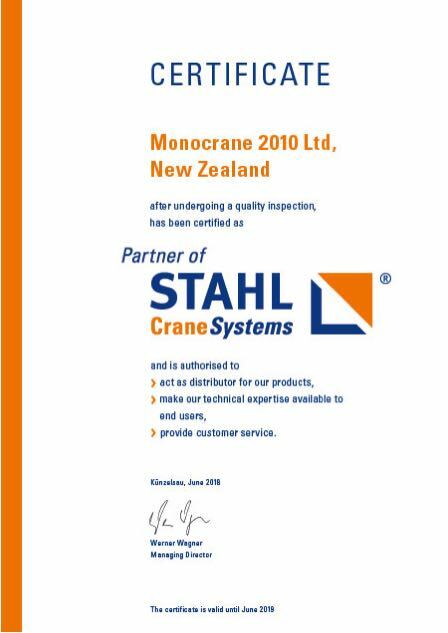 MONOCRANE 2010 invest in the qualifications of our staff!